The Nantahala Forest, established in 1920, is the largest of the four national forests in North Carolina, and has elevations that range from 1,200 to 5,800 feet, with the last part of the Mountain Waters Scenic Byway passing through the forest. Nantahala means “Land of the Noonday Sun.” It’s the name of a National Forest, the river that runs through the forest and the lake formed when the river was dammed in 1942. Lake Nantahala has nearly 40 miles of shoreline and offers boating, fishing and swimming. Nantahala NC offers a rugged, natural setting ideal for outdoor recreation such as hiking, fishing, mountain climbing, kayaking, horseback riding and mountain biking. Aquone Cabins are traditional Appalachian style log cabins, and all come with hot tub, pool table, satellite TV, DVD, BBQ grill, and outdoor fire pit. Vaulted beamed ceilings, wood floors and handmade furniture. On site hiking and canoe rentals. Only 1 mile to Nantahala Lake's. Best Fly Fishing in WNC! The Cabins at Long Branch are secluded on 40 acres bordered by a trout stream. Easy access minutes to whitewater rafting. Stone gas log fireplace, outdoor grill, large porch with rockers, central H&A, locally crafted furnishings, full kitchen, W&D, flat screen sat. TV+DVD. Both cabins sleep up to 6. FREE WIFI. 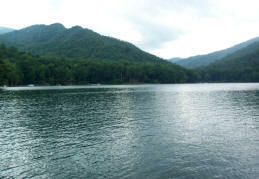 Lake Nantahala is located at a 3000 foot elevation in the heart of Nantahala Forest. Created in 1942 by Nantahala Power to provide electricity for the war efforts, the town of Aquone was displaced by crystal clear waters and 42 miles of shoreline. Considered one of the top fishing lakes in the Southeast, Lake Nantahala is home to Walleye, Lake Trout, Brown Trout, Bluegill, Crappie, Small Mouth and Large Mouth Bass. Recreational opportunities include boating, swimming and water skiing. The NCWRC maintains one public boating access. Nantahala National Forest is the largest National Forest in North Carolina and includes peaks surpassing 5,000 feet, waterfalls, hardwood forests and 100s of miles of trails. Enjoy the panoramic views from Whiteside Mountain or Wayah Bald. A 2-mile loop trail to the top of the Whiteside cliffs, provides a spectacular view. Wayah Bald is especially beautiful in June when the azaleas and laurel bloom. Joyce Kilmer Memorial Forest, with it's 400-year old trees, is another breathtaking sight, as is Whitewater Falls - the highest falls east of the Rocky Mountains. Click the image to see a map of Nantahala Forest. Joyce Kilmer National Forest is a virgin hardwood tract named after the author of "trees" includes 400 year old poplars with 20 foot diameters. Beautiful walking trails including one of the most adventurous in Slickrock Wilderness. Mountain Waters Scenic Byway winds from Franklin to Nantahala in a beautiful, scenic drive which is designated as a National Scenic Byway, known as the Mountain Waters Scenic Byway. Between Franklin and Nantahala, a side trip to Wayah Bald is recommended. There is a mile-high overlook from an old stone fire tower built by the Civilian Conservation Corps Four states are visible from the tower which gives you a panoramic view in all directions.